Infosys asks for a certain list of documents that you need to submit to the company while joining the training program. This document list consists of education certificates/documents, medical certificate, NSR registration, service agreement etc. The Infosys Service Agreement is the crucial document for which almost everyone has doubt about how to print it and sign it. I am writing this article to give a brief explanation about how to do it. You must follow following given steps in order to make service agreement an accurate and correct one. The first question which comes to our mind is how to print the Infosys service Agreement? STEP 1) Download the fully prepared Infosys service agreement. Click on download button to click it. This document is in a MS Word document (.doc or .docx). Step 2) In instruction provided by Infosys, service agreement needs to be made on stamp paper of Rs. 200, so it will be fine if you make two stamp papers of Rs.100 each. Because it will not be able to print whole service agreement page on one stamp paper. So you will have to break the 1st page of the Service Agreement into two parts as the stamps.Then print the 1st page in those stamp papers. Step 3) Then the next four pages of the Service Agreement can be printed in normal A4 size papers or green-colored A6 size papers (legal sheets). Step 5) Somehow, if the signature of the company is not printed on the service agreement, then the company would sign it on the date of joining at Mysore. But do not forget to leave spaces for it mentioning signatures. Step 6) Now you are left with notarization of service agreement, for which you don’t have to take a headache. You can easily get it notarized on your date of joining. They will charge a fee of Rs 60/- for this. A) The first witness should be from HRD. Get it signed on your Date of Joining. C)The third witness has to necessarily be your friend or colleague. I hope this article will help you to make service agreement in an accurate and correct manner. If you still have any queries, feel free to ask. Also, share your views/feedbacks in the comment section. 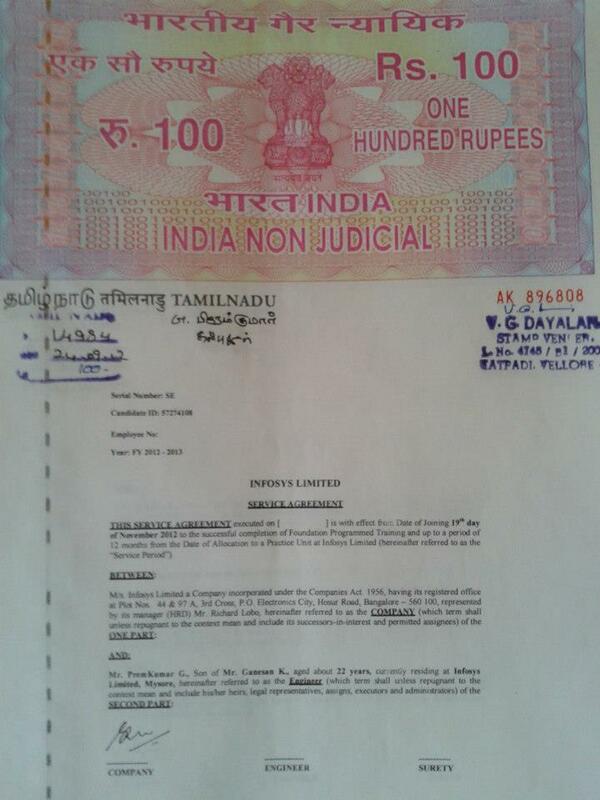 For service agreement, I have done the franking of 200 Rupees on legal sheets. Is notary required after doing franking. What are the documents needed for NSR Registration? I have 3 queries plz reply me..
1)They talking about Notarized the service agreement but i don’t know how to notarized. Can i notarized it in pune Infosys campus? 2) Is it mandatory that we have passport I don’t have passport so, what i hv to do now? 3) I completed my Graduation but I don’t have degree Certificate so, is it mandatory to submitted it on DOJ? Is there is option of Indore DC while filling choice for posting after training? No, you do not need. Do i need my parents for notary to be done at mysore campus?? I have printed content on 2 100 rs stamp paper and left content on regular a4 size paper so is it valid? When should I go to Mysore training campus my doj is 25th june? Hello I got a offer letter…in that they have asked to disclose pan to infosys on or before 30 days from doj.so how to disclose that?? Hi .. my joining date is 20th November , will i b able to get inside the campus on 19th or will my hostel be aloted on 19th..! My doj is on Nov 20. So when should I report at Mysore campus? Thank u so much ….. This post has written two years ago…. Is this same applicable now?? NSR is initiated by NASSCOM. NSR facilitates development of Fact Sheet of Credible, Permanent and Accessible information about each registered person. This information can be accessed and used by the industry and its clients with the authorization of such registered person. You can visit this link to know the procedure to get it. Hi Admin, What is this “National Skills Registry” document? How can I get it? No, there is no test at time of joining. my date of joining is 14 Dec 2015. I just want to ask you is there any test conduct company at a time of joining? and if yes How can we get grate score in that? No, they will open a new ICICI bank account for you once you join. It does not matter. Once you join Infosys, you have to update your address in system . There you can update correct address. hi admin.. my joining date is 6 september and now i found my home address is slightly wrong in the offer letter. what i will do now ? My father met with an accident so he can’t accompany me to Mysore Campus. Is it necessary to put the signature of surety at Mysore campus during joining? Training is usually for 4-5 months if it is not Fast track training. Generally after training they will send you to posted location. But again it depends on business requirements. Yes working period is 5 days a week. How many days or weeks is the training period . If they clear the assessment in first PKT will they send as home early , will they have any weekend holidays.. ?? Please let me knw Admin..
From today onwards I will concentrate on that. Do not worry before that you will be given training on that. You will get study material (slides).Test will come only from slides so if you are doing it properly you can easily crack. Though you will need to practice on coding. If you want to study you can study basic oops concepts in advance. Hiii admin, I heard that there will be a hand on test conducted on 10th day of training.but I’m not much good in coding.i know only basics of java (coding) ,then how can I crack it?can u suggest me any material? if the surety is my father, can my mother be the second witness??? can we sign the agreement before arriving in the campus ?? Hi NIthin,You are NOT allowed to carry laptop/hard disks/ pen drive etc to mysore campus. There is no internet facility in hostel rooms. I had asked you previously about whether or not we are allowed to take our own laptop/hard disks/pen drives to infosys mysore campus.. You had told “no” , so that no means i will not be allowed to carry my laptop /hard disks etc to my room where i live inside the mysore campus hostel? and Do we have Internet facility in out hostel rooms(wi-fi, LAN ) or we need buy dongles or put net pack in our mobile itself? Is it necessary to carry my passport on the date of joining for the training at mysore?? Hi Mohit. Can you tell me the stipend that is paid to the trainees at Mysore campus? Hi, Yes you can get job at Gurgaon also. You will be asekd to give 3 prefernces for your job location you can fill Gurgaon on top (Though you may get mail in advance as we got and our next batch got that there is no requirement in Chandigarh,Jaipur, Gurgaon..But whosoever filled chandigarh and Jaipur they got posting there.) But Gurgaon is BPO so think it before applying for Gurgaon. hello admin. I have a few queries related to the job location. Since i am from gurgaon and we have infosys there so is there a chance i can get job location as gurgaon after my training at mysore?? You just take signature for other witnesses. HRD witness will be signed at Mysore itself. There are number of HR teams that conduct placement drives. It is hard to get to know about whom you are talking. You can get in touch with your TPO to get the HRD contact details who conducted placement drive in your campus/joint campus. TPO will definitely have this information. Is adhar card sufficient instead of driving license? Yes you can. But preferably use black pen. If it a co-trainee then it is better. Though it can be a friend back at home. No one will ask. But still if you have any co-trainee friend let him be the third witness. Does the third witness need to be a co-trainee or can it be a friend back at home? For interns, Service Agreement is not required. Is it mandatory for interns who are joining infosys at 19 january to prepare service agreement ? hi, should we have any id proof for the witnesses who signed in the agreement. It can be done at date of joining also if you failed to print company signature on agreement. Hi, i have notarized the service agreement in my hometown itself . Will it create any problem?? Is it need to type all pages of service agreement? That will be given during your induction. what about the employee no.